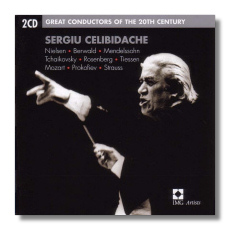 Sergiu Celibidache is remembered as a maverick but there's no denying his breadth and wisdom of interpretation. This jam packed collection of recordings comes from various sources and contains some fine performances of core and rare repertoire. Nielsen's 'Maskarade' is given a rollicking interpretation with the Danish National Orchestra (former DRSO) playing quite magnificently throughout in their countryman's party piece. Berwald's Sinfonie singulière is also quite breathtakingly done with slightly faster speeds making the beauty and clarity of the music come out much more clearly. Mendelssohn's 'Italian' is also well played by the Berlin Philharmonic Orchestra in an exhilarating live performance that is one of the set's better recordings. A 1948 recording of Tchaikovsky's 'Nutcracker Suite' with the London Symphony is also quite ravishing. Hilding Rosenborg was one of the composer's which inspired Celibidache's imagination and this white hot recording of the 'Marionetter' overture is certainly up among the best. Heinz Tiessen's Hamlet Suite is quite a discovery and is also beautifully played by the Radio Symphony Berlin who give their all for their conductor. Mozart's 25th is quizzically interpreted by an in form Celibidache whilst Prokofieff's Classical Symphony is also pretty enjoyable on all counts. Finally we have some glorious Strauss family items that are quite the ideal way to end an album. First class remastering and warm hearted performances are surely a recommendation to historical recording lovers.